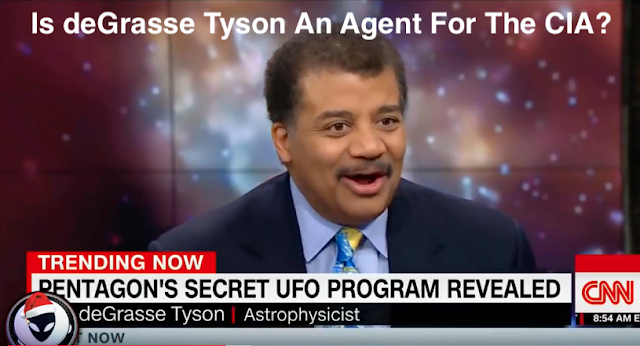 UFO SIGHTINGS DAILY: Neil deGrasse Tyson Appears To Be Working For US Govt To Hide Alien Existence, Dec 2017, Video, UFO Sighting News. Neil deGrasse Tyson appears to attempt and fail at debunking a US Navy pilot and his testimony with footage of a UFO. He also says the head of the secret pentagon program has no clue about aliens. Its clear to Secureteam10 of Youtube and to me that this man is being used by the US govnement or CIA to hide and downplay the existence of aliens. The US gov is known for using Hollywood types all the way back to Lucy Ball in the 1950s, so this is not a new tactic. NASA used Billy Nye to try to debunk aliens, but failed too much, they even tried to use Stephen Hawkings, which after 5 years of denying the existence of aliens finally in 2017 came out and said there may be aliens and they may destroy us. The US gov is using these people and more to try to control the publics interest, and down play it, thinking the public are a bunch of idiotic fools that can be mentally controlled by the government. Chance of him working with the US gov agency...at 98%. 2% chance he is just clueless.